Let’s say you’re going on a multi-day distance ride, like Classic by Cycle Oregon. First off, congrats! A supported multi-day ride is so much fun. Secondly, let’s talk gear. Every event is different. Cycle Oregon makes their guidelines very clear, and very reasonable. After all, someone other than you has to handle your luggage just about ever day, so it’s only fair to ensure it’s of a reasonable size and weight. Lay out your dream gear then start trimming back to 90% essentials and 10% indulgent items and fun stuff (funny outfits, your fave after ride shirt, a cute adventure dress). Try to bring only one of anything that’s not going to get extremely dirty. If you can’t decide between a few items, select the ones that are more compact, warmer, breathe better, etc. Prioritize features over aesthetics. That remaining 10% is for your aesthetics. Make sure you have plenty of space for the essentials like toiletries, sunscreen, a towel, etc. You want to enjoy the ride, so don’t be too hard on yourself. If you know your favorite shirt is the perfect way to relax after a long day in the saddle, bring it. It will feel so good to slip it on after a shower. Consider many places have hot days and cold nights and bring what you need to account for all weather so you never have to suffer. Remember: There are no bad days, just bad gear (and food?) choices. 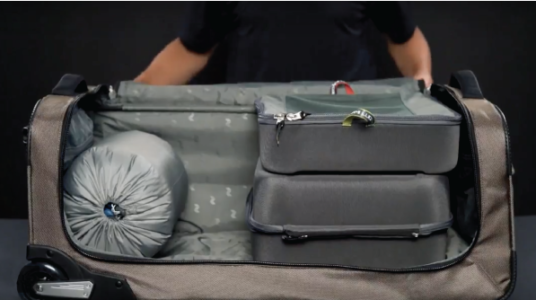 A system like Oregami Luggage makes it easy to separate dirty from clean, ride from hang out, swimwear from PJs and summer clothes from the cozy cold weather gear. After all, no one wants that dirty chamois touching… well… anything, really. Consider stuff sacks (they’re inexpensive) or compression sacks to help organize and condense your gear. They work wonders on fluffy sleeping bags, puffy jackets, and most other apparel. You’ll be surprised how much room they can free up. Know where everything is so that when it’s early morning and you’re hading out for the day, you can easily grab the day’s outfit without thinking. Or when you’re tired at night, you can hazilly throw on PJs without accidentally grabbing.., yup, you guessed it: that nasty chamois. And on that note, have a great ride!